My introduction to Nigerian cuisine couldn't have been better. Recommended by a duo, one, an Indian who's been there for 10 years and another, a local Nigerian who swears by the place. 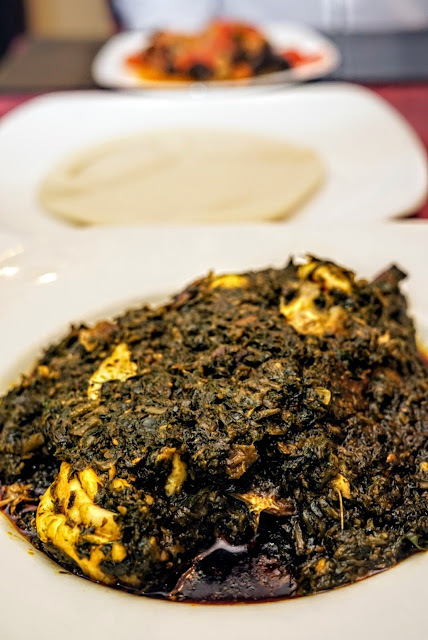 While the foods on the street and dishes are for another post, Lydia's Place is a small restaurant owned and operated by a Nigerian who apparently cooks from the heart. Even for the walk between the kitchen and the table, the food comes covered with cling film. It takes forever to get the food as she apparently makes every Dish from scratch. 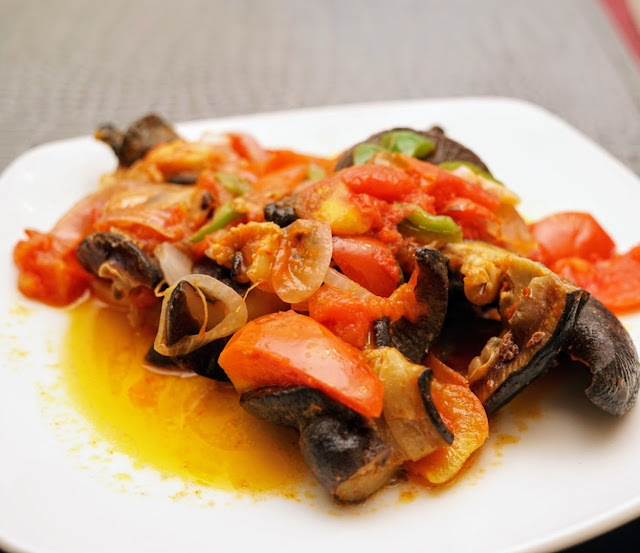 Lagos, the commercial capital of Nigeria is a great way to get introduced to the food of the country. Finally, after hearing so much about the Jollof Rice, I got to savour this much loved dish. And it reiterates the fact that every culture has a rice based one pot dish that the country loves. Like our very own biriyani, the Jollof Rice is the national one pot dish. 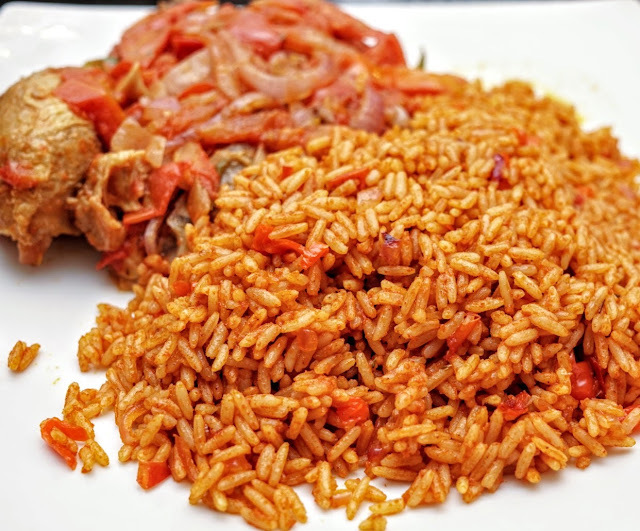 With a strong tomato base, and the onion and meat simmered in tomato served on the side, Jollof is the Nigerian Biriyani. The chicken takes on the flavour of the tomatoes with no distinct flavour of its own. But unlike the biriyani, the Jollof Rice has a lot of bite to it. Almost like the risotto. So I guess, this is the midpoint between the risotto and the biriyani. But comparisons apart, the Jollof Rice is a must try dish when in Nigeria. What they call the soups are in fact the gravies. Typically served with pounded yam to make up the starch, we got ourselves another local favourite, the Afang Soup. A variety of green similar to the greens we mash up in South India, we opted for the Afang Soup with Croaker fish and Prawns. One thing about the prawns in Lagos, they are HUGE. Like almost every order of prawns come with the tiger variety. Thick with strong flavour of greens, the prawns were well cooked without getting rubbery. The pounded yam, with almost no flavour to it, complemented the soup perfectly. The dish that my palate didn't take a liking to was the spicy snail. Very similar in flavour to the tomato base of the Jollof Rice, the snails were way too rubbery for me and I prefer the French preparation. The locals, though seem to like it that way and they enjoyed the dish. Portions are huge. Like Huge. What I could easily share with 2 other people, Nigerians order a portion for themselves. I didn't see any dessert on the menu. Rice was priced at NRN 3000, the Afang at NRN 3500 with add on fish and prawns costing about NRN 7500. At almost 1/5th the Indian rupee, a meal typically costs about INR 1500 per person ($25) in decent places.